In most beginner-level art classes, the teacher sets up a still life and tells the students to start painting. 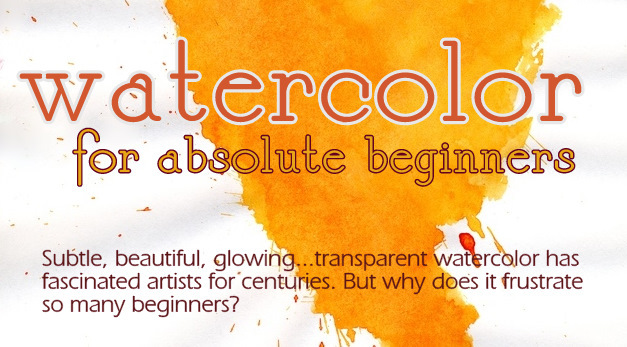 But that doesn't answer the dozens of questions that beginners and amateurs have about using watercolors. Tubes or pan paints? What kind of paper and brushes are best? Wet paper or dry? How do I get those glowing effects without creating muddy lagoons? The Watercolor for Absolute Beginners class is different. It's designed from the start to "build in" success, with the right paper, paints, brushes, simple exercises, and patient instruction. if you’ve never painted before and you suspect you "have no artistic talent"
Unlike acrylics or oils, watercolor paints have a mind of their own -- rich and juicy, yet unpredictable and hard to control. But learn to work with them, and they'll do most of the work for you. You'll study exactly how to handle the paints to get the beautiful effects only watercolor can provide. No special artistic or drawing skill is necessary. Really. Anyone, including you, can learn to do it -- all it takes is practice and persistence. So take the pain out of painting! If you'd like to express yourself with watercolor, this is the easiest place to start. The 6-week watercolor courses meet once a week, evenings from 7-9:30 pm, or on Saturdays from 12 noon-2:30 pm. Check the Sign-Up page for day of the week, exact dates, studio location, and how to pay. The 3-week DRAWING course, given three or four times a year, meets weekly on Tuesdays, from 6:30-8:30 pm. An occasional One-Day Drawing Workshop is also offered. All classes meet on Union Square in Manhattan, New York City, one block from the Union Square/14th Street subway stop. Trains: 4 5 6 N Q R W L (check the L service, as it's often sketchy on weekends). Tuition is $270.00 for 6 weekly classes, payable by cash, Venmo, or Zelle (no personal checks, please). You can also pay via credit card, prior to the first class, using PayPal online. That link and other details are on the Sign Up page.